Eating chinese food and talking about suicide in this mukbang. I apologize that its so dark. Hope you enjoy. — My microphone: Blue Yeti Mic: . Im eating some leftover chinese food for this ASMR video. Hope you enjoy! — My microphone: Blue Yeti Mic: — Feeling generous? Please . In this mukbang, I eat some jack in the box and tell you how I lost some massive amount of weight. I hope you enjoy this eating show! 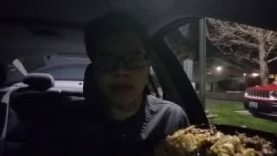 Eating Jack in the box in the car on my break 🙂 Hope you enjoy this mukbang. — My microphone: Blue Yeti Mic: — Feeling generous?